This museum is located at the airport, quite a distance out of town. I also found it poorly signposted, the museum sits tucked away between entry- and exit roads to the airport terminal and ramps. 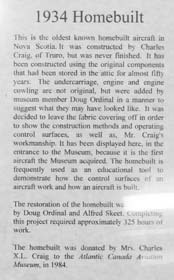 The museum was set up by local enthusiasts, the idea launched in 1975 but realisation had to wait until 1985. The wooden building was formerly used by the local tourist board (still present) and in 1996 a large hangar was added. A nice collection was formed over the years. Entrance was free, donations welcomed and gladly given. Only on our way out a few other visitors entered the building. The caretaker was out for lunch somewhere, which meant the souvenir shop was closed, alas. Not bad looking for a 'homebuilt'! 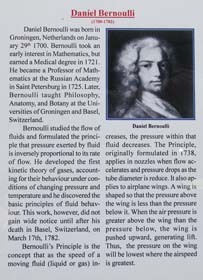 Nice to see the Dutch recognised here for a valuable contribution to aviation! From fabric-covered wings to hypersonic ones! The Silver Dart (or Aerodrome #4) was a derivative of an early aircraft built by a Canadian/U.S. team, which after many successful flights in Hammondsport, New York, earlier in 1909, was dismantled and shipped to Baddeck, Nova Scotia. 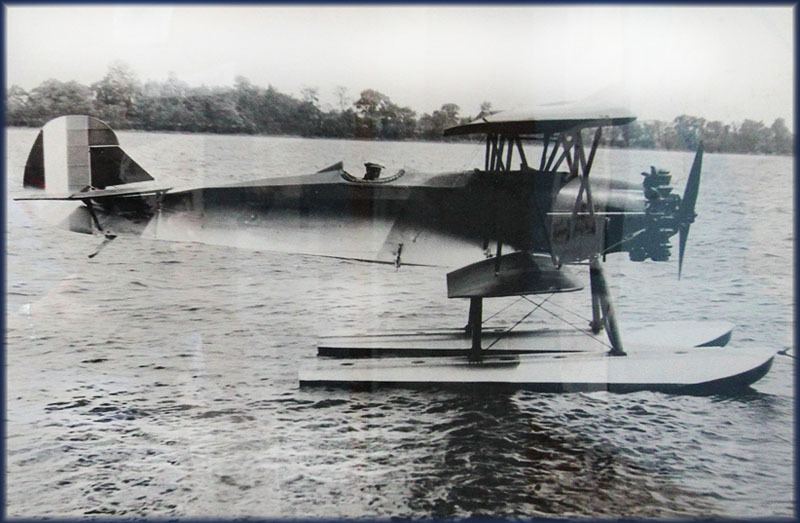 It was flown off the ice of Baddeck Bay, a sub-basin of Bras d'Or Lake, on 23 February 1909, making it the first controlled powered flight in Canada. The aircraft was piloted by one of its designers, John McCurdy. The original Silver Dart was designed and built by the Aerial Experiment Association, formed under the guidance of Dr. Alexander Graham Bell. The Silver Dart had great difficulty taking off. On its fifth flight on 2 August 1909, McCurdy wrecked the craft when one wheel struck a rise in the ground while landing. The Silver Dart never flew again. 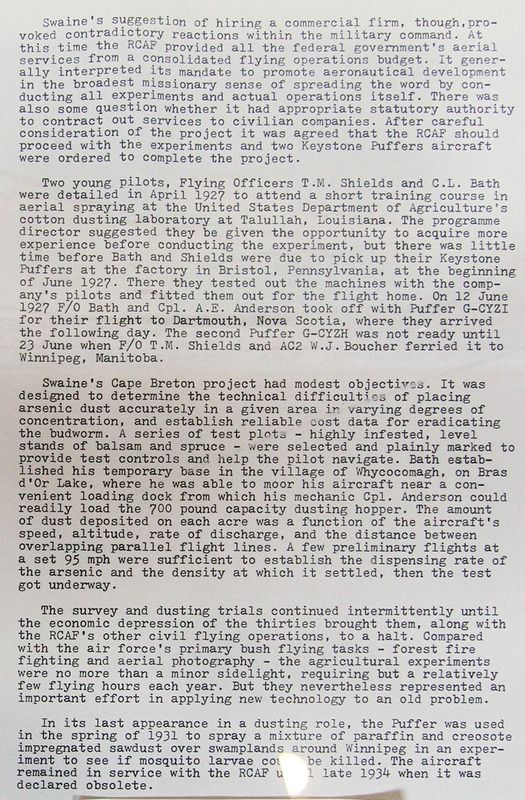 The history of aviation in Nova Scotia shows great variation! 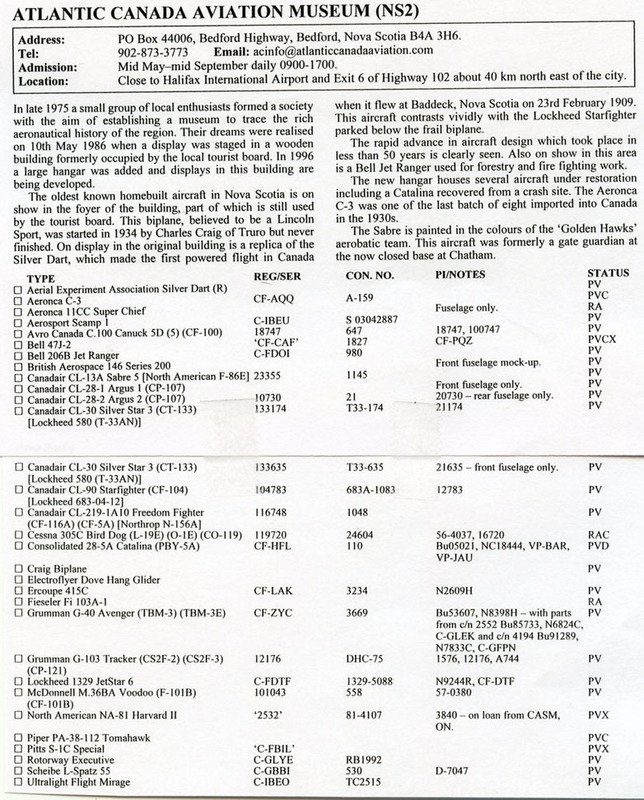 CF-RZU was a problem for me to identify, but Anson Chappell helped me out: "C-FRZU is a Piper Tomahawk, used extensively in the Maritimes for flight training." like a V-1 Flying Bomb from World War II. The Wright R-3350 Duplex-Cyclone was one of the most powerful radial aircraft engines produced in the United States. It was a twin row, supercharged, air-cooled, radial engine with 18 cylinders. Power ranged from 2,200 to over 3,700 hp (1,640 to 2,760 kW), depending on the model. First developed prior to World War II, the R-3350's design required a long time to mature before finally being used to power the Boeing B-29 Superfortress. After the war, the engine had matured sufficiently to become a major civilian airliner design, notably in its Turbo-Compound forms. In the background sits restoration project Consolidatd 28-5A Catalina (PBY-5A), CF-HFL (c/n is 520: it is often quoted as s/n 110 -also officially-, but that is merely a line number). During the 1990s it had been reported 'for restoration'and was up for painting in Labrador Airways colours in 2002; still long ways to go! You may want to see a photo by Ron Mak, while this derelict Canso was in transit at Goose Bay! 10732, RCAF Memorial Museum, Trenton, ONT. Impressive warbird restoration: Grumman G-40 Avenger (TBM-3E) CF-ZYC (c/n 3669, ex/ Bu53607, N8398H); restored using parts from c/n 2552 Bu85733, N6824C, C-GLEK and c/n 4194 Bu91289, N7833C, C-GFPN. 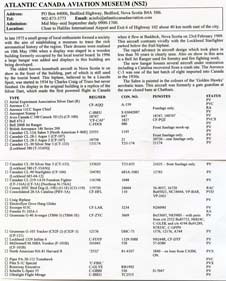 The identities above were taken from Ogden's Air-Britain book: C-GFPL (Tanker 24) was not listed. Aad van der Voet has this to say: "Avenger Tanker 24 C-GFPL is indeed wearing fake markings. It is actually c/n 3669 ex CF-ZYC (Tanker 20), as the Ogden book says. This aircraft crashed on take-off from Juniper (NB) on 20May1975, and the wreck was abandoned there. 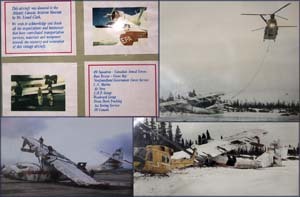 It was salvaged from the accident site 10Jan97 by the Atlantic Canada Aviation Museum and then transported to the Forest Protection Ltd. facility at Frederiction (NB) a few months later for restoration, using some parts from C-FBEF c/n 3140, C-GFPN c/n 4194 and C-GLEK c/n 2552. After restoration it was painted to represent Tanker 24 C-GFPL in Aug2005 (when it was still at Fredericton). It was finally delivered to the museum a month later and placed on display." Canadair CL-13A Sabre 5 (North American F-86E), 23355; this former gateguard at the now closed base at Chatham has been painted in the colours of Canada's 'Golden Hawks' aerobatic team.